Spa facials can be relaxing and rejuvenating, as well as beneficial to the skin. A facial can cleanse the skin, shrink pores, moisturize, reduce blemishes and tone your skin. Full facials can be expensive and time-consuming in a professional spa, but you can give yourself a spa facial at home at your own convenience and for far less expense -- most of the ingredients you are in your kitchen. Put your face over steam to open your pores and loosen dead skin. You can boil a pot of water on the stove or fill your sink with hot water. Lean over the water, keeping your face about 12 inches away, and allow the steam to rise up into your skin for five minutes. Wash your face with a gentle cleanser to remove impurities and clean out your pores. You can use a store-bought cleanser or make your own by combining 2 teaspoons of oatmeal, 2 teaspoons of dried milk and 1 teaspoon of powdered cinnamon. Rub this paste onto your face in circular motions, and then rinse away. Exfoliate your skin to scrub away dead skin cells and soften your skin. You can use a store-bought exfoliating scrub or brush, or make your own by finely grinding 1/4 cup of almonds in a blender, then mixing them with 1/8 teaspoon of mayonnaise. Rub the exfoliating scrub onto your face in small circular motions, and then rinse it away. Apply a mask to your face to moisturize, reduce oil and shrink pores. 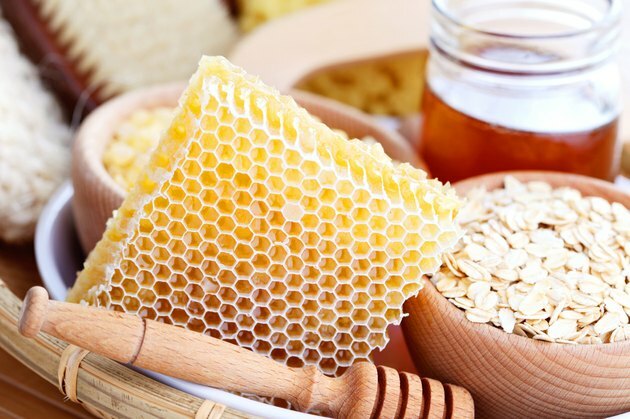 Combine 2 tablespoons of honey with 2 teaspoons of milk to make your own mask. If you have dry skin, combine a mashed avocado with a mashed banana. For acne-prone skin, grate an apple and combine it with 5 tablespoons of honey. Spread the mask onto your face. Leave it on for the next step. Place a cucumber slice on each eye. This will soothe your eye area, reducing puffiness and dark under-eye circles. Wait 20 minutes, and then remove the cucumber slices and rinse away the mask with cool water. Give yourself a facial massage to stimulate blood flow and provide relaxation. Using your fingertips to apply light pressure, begin at the middle of your forehead and make small circular motions, moving your fingertips toward your temples. Continue massaging your face around your eyes, nose, cheeks, mouth and chin. Apply a moisturizer or cold cream to your face and neck. Look for a moisturizer that is specially formulated for your skin type, whether it is oily, dry or prone to blemishes. Apply a toner to refresh and refine your skin. Juice a cucumber and use a cotton ball to rub the juice onto your skin. Test all store-bought and homemade products on a small area of your skin before use. If you develop a rash or irritation, do not use the product. You can give yourself a relaxing and realistic spa experience by lighting candles and decorating the area with flowers. If you make your own spa facial products, you can store the leftovers in the refrigerator for one week. Skip the steaming step if you have sensitive skin or a sunburn. Spa Living for Health: Ever Wanted Homemade Facial Recipes That Are Simple and Get Results?